To send a private message, first click New chat at the top of the app to start a new conversation. Type the name of the person or people you want to chat with. Then, compose your message and click Send . You can include up to 50 people in a group chat. Note: If you want to start a conversation with the entire team, try a channel conversation. To loop more people into a private conversation, just click Add people in the top right corner of your screen. Then, type the names of the people you'd like to add, select how much of the chat history to include, and click Add. 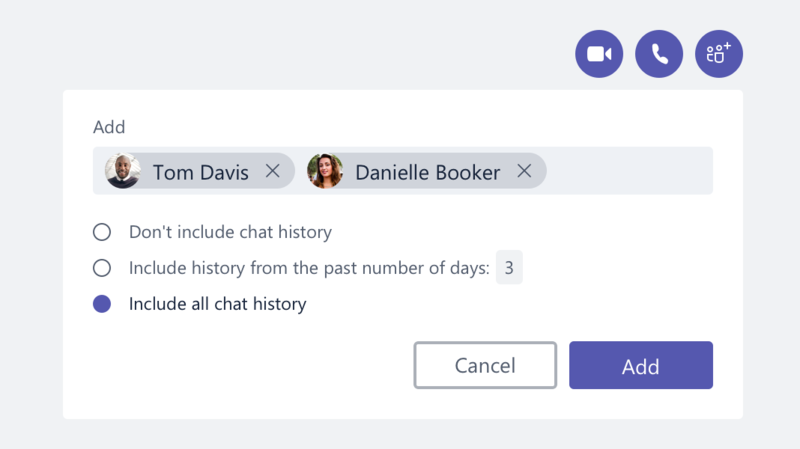 Note: Currently, you can include chat history only when adding someone to a group chat (not a one-on-one chat). Tap Chat > New chat and type the name of the person or people you want to chat with. Then compose your message and tap Send . In the group chat header, tap the participants to see the Group chat details. Then tap Create a new group chat and type the names of the people you want to add. You can include up to 50 people in a group chat. For now, go to the desktop or web app to include all or part of the chat history for new participants. In the group chat header, tap More options > Chat details > Add people and type the names of the people you want to add. You can include up to 50 people in a group chat.